This week my son, Ian McNeny, joins me and asks all the questions! 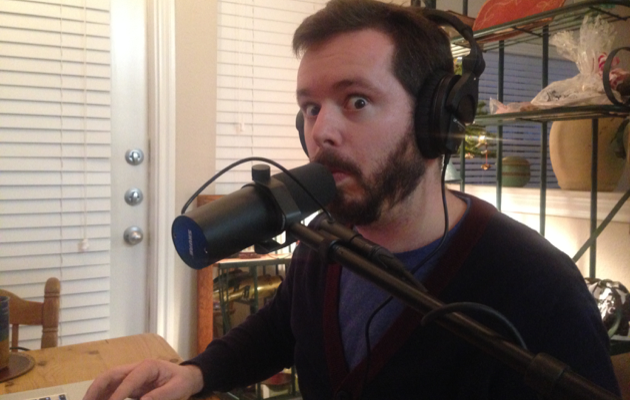 He visited us for Christmas and brought his podcasting equipment with him to record with friends and chat with my blue-eyed cowboy and me about homeschooling. The result was perfect for a show on my show as well as his so we’re sharing! Ian is a graduate of Wild Flower Academy and Collin College in Plano where he transferred well over 60 credits to enter as a Junior at the College of Santa Fe where he worked hard for two years and completed his BA in Film Production. He has freelanced as an assistant editor at Reel FX Creative Studios (an animation company) an editor at Tocrok Productions and the Dailies Assistant forDALLAS on TNT. He recently moved to California where he works for MTI Film and runs his own podcast network. He is Owner and Executive Producer for his own company, McCook Media and has made a pilot for a potential TV series, which he is shopping in L.A. Ian specializes in story and narrative film/video editing, Live Event editing and story and narrative screenwriting. Tune in this Friday at 12 noon CT and hear my Texan and me tell the back story behind our decision to homeschool. Bring your tea and prepare to be entertained! For me, it is the constant peussrre of mommy guilt . For whatever reason, I find myself frequently wondering whether or not I am truly doing all that I can . Then, this leads to greater stress on my mind, heart and soul. It can be a vicious cycle. I have found that having a core group of online friends has truly helped. A person CANNOT homeschool without having a very supportive group behind them. This is especially true when they are homeschooling children with challenges.One thing I CAN say is that a homeschooling parent has to do exactly what you mentioned in the first paragraph. The only right way is the way that works for your individual children and family. We get in trouble when we try copying other people or compromising what we know to be best. I spent the first 3 years of my homeschooling attempting to educate my energetic/sensory sensitive kids just like all my friends educated their children. We tried following a strict routine, sitting at a table. We tried sitting at desks. We tried ALL sorts of things that other moms I respected did successfully with their kids. The only problem was, my kids ALL struggle GREATLY with any work that includes hand-writing excessively and workbooks and textbooks. We have since found an online program that has nearly eliminated the tears. I still sometimes watch wistfully as other parents are able to sit with their large families, around the same table, and all learn out of a book. I learned that is MY learning style and I had to find what works for my 3 kids. It is VERY difficult sometimes to break free from others’ expectations of me, but I have been learning that is the ONLY way we will survive as a family. We now have our OWN routine which means when the kids are emotionally in an unstable place, we wait an hour. Maybe we’ll go outside and play. Maybe the kids will all go back to their rooms and we’ll start the day over. Sometimes, we all just scream (not AT each other just scream to get the agitation out). It probably sounds TERRIBLE, but it helps all of us feel better. Then, we go on with the day.